Welcome to the official website of The Ridge at Paradise Point Homeowner’s Association. Here you will find community news, updates, events, and HOA-related activity. The Board of Directors (BOD) will also use this website to relay important information and updates about the community. Please note that some content is password-protected (for homeowner’s only). If you have a question or comment, please contact bod@paradiseridgehoa.com. Access Paradise Ridge HOA forms and documents here. NOTE: This section is password-protected for homeowners only. Contact BOD for password. Stay connected with Paradise Ridge and share your thoughts, opinions and suggestions. Click here to access our bulletin board. Stay up to date with local events happening in and around the Paradise Ridge and Deep Creek Lake area. Click here for our event calendar. 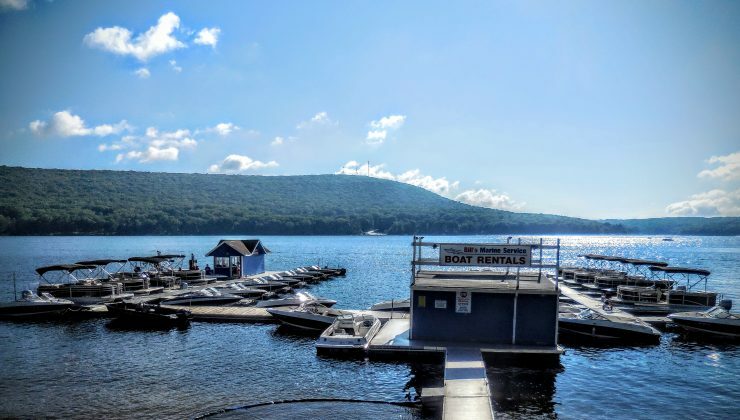 Learn more about Maryland’s largest inland body of water – click here for information about beautiful Deep Creek Lake. Have a question or comment for our Board of Directors? Click here to contact them with your comments or suggestions. Several of the homes in Paradise Ridge are available as vacation rentals. Click here to see a list of currently available rentals by owner. For the thrill seekers, Deep Creek Marina offers many of the latest and greatest in sports boats including the Sea Ray/Regal, Sea Ray Sports Boat with tower, hp 210 Select, the 23 foot Bowrider, and more. With speeds up to 48 miles per hour, these sports boats can accommodate up to 10 people, depending on the make and model of your choice, for an adventurous day on the water. Rentals are available daily, with time frames from 2 hours to 7 days. 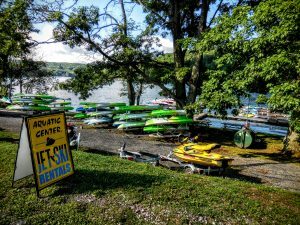 If a workout on the water is your preference, The Aquatic Center offers the 1 person kayak, 2-3 person canoe, or the paddle board, which provides a fun, and easy way to work on your core and balance strength while enjoying relaxing views of the lake. So, you’ve decided to indulge in a relaxing day of fishing on the lake? Deep Creek Marina includes a variety of engine and non engine powered fishing boats to accommodate both the novice and the seasoned fisherman. Rentals include the Tracker Utility 3 person seater, Tracker Grizzly-no engine, the Tracker Pro, Mako Sciff17CC and more. Another great way to enjoy the beautiful lake is via the pontoon boat. The flat deck accommodates a large number of people and is great for swimming, fishing, cruising, or just a leisure day of sightseeing. Bill’s Marine Service includes a variety of pontoons, including the Sun Tracker Party Barge, for your fiesta on the lake. Rental prices vary according to rental type and duration of rental. 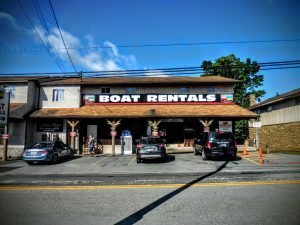 Some boat rentals require a Temporary Boating License for driver’s born after July 1, 1972, which any Deep Creek Marina employee will be more than happy to assist you with.